Family Run Business established for over 30 Years! 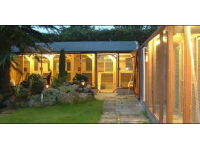 A1 Cattery is a well established Family Run Cattery that has built up an enviable reputation over the last 30 years. We pride ourselves in giving a Friendly and Caring Service. We are very competitive with our prices, situated in the lovely Cheshire village of Winterley between Sandbach and Crewe. We needed to leave our 15 year old cat in a cattery for the first time in his long pampered life. We were naturally concerned, but when we arrived at A1 it was such a wonderful calm, clean and beautiful setting we were immediately reassured. We were able to leave him in his fabulous, luxury, heated 'pen' without the concerns that we thought we would have. Mrs Oakes was very helpful and organised and administered his medication as required. Would have no hesitation recommending this cattery.